Lune Time Bar is a very spacious bar with a good line up of girls, cold air conditioning and comfortable seating. With a raised stage you can get a good view of the girls from anywhere you sit. Drink pressure is low and waitresses are friendly. 2018 Update : Please note this bar has been demolished. This spacious and well laid out bar is located on Perimeter between the luxurious ABC Hotel (Angeles Beach Club) and Ponytails Bar. Directly next door is the sister bar "Showtime" a much smaller bar compared to Lune Time. This Angeles City bar has a wide exterior and is easily noticeable by passing tourists and motorists. The interior of Lune Time Bar is one of the reasons this bar is a great place to visit. The immense space inside allows customers to move around freely and find seating that keeps you well away from other patrons. You certainly will not feel like your shoulder to shoulder with other customers in this bar. The stage is set in the far corner of the bar and being raised up higher than the seating around the stage allows a good vantage point no matter where you sit. The seating is comfortable lounge style seating and the bar has mirrors on the wall behind the stage so you can get a good look all around the girls performing. 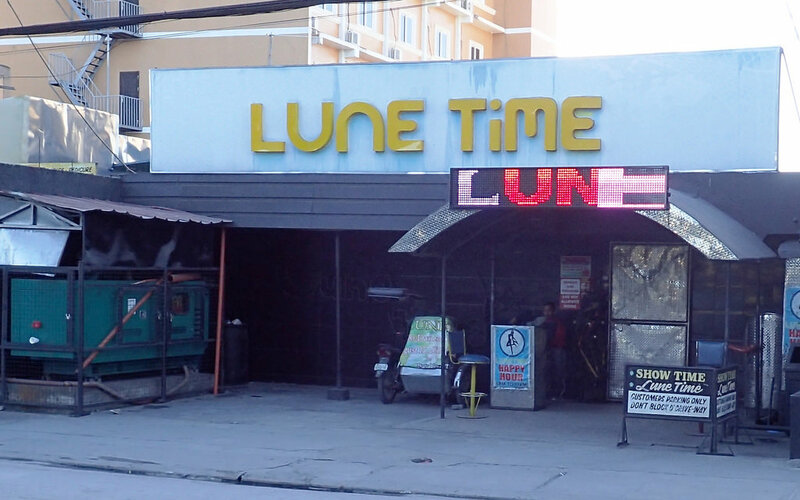 Lune Time Bar has no pool table, no generator and no credit card payment facilities.